Soda fired porcelain, cone 10. My work is soda fired porcelain. It begins with the consideration of function, and the goal is for the form and surface of the pots to be interdependent. Making the work starts with a three dimensional division of space, continues with drawing on the surface, and finishes with the addition of color. New ideas are gradually incorporated into previous bodies of work through making. Source information for my pots can be motivated by something as simple as looking at the patterns in the stacked bricks of my kiln to something as complex as the forms in 18th century European manufactured silver. I experience the evolution of my work through creative repetition in the studio. I am interested in having my work display both practical and extravagant attributes. I am drawn to work that is rich in ornamentation, with lavish use of materials- both scarce in a culture of mass production. Functional pottery, in its connection to sustenance, closely relates to the human body, revealing what it means to be human. Handmade pots are potent in their power to reveal the extraordinary, within the ordinary. I am driven by the insatiable pursuit of the “good pot”. Successful in terms of tactile, visual, and functional attributes; lastingly significant when packed with the passion of the maker- reflecting humanity, and contributing to the craft. 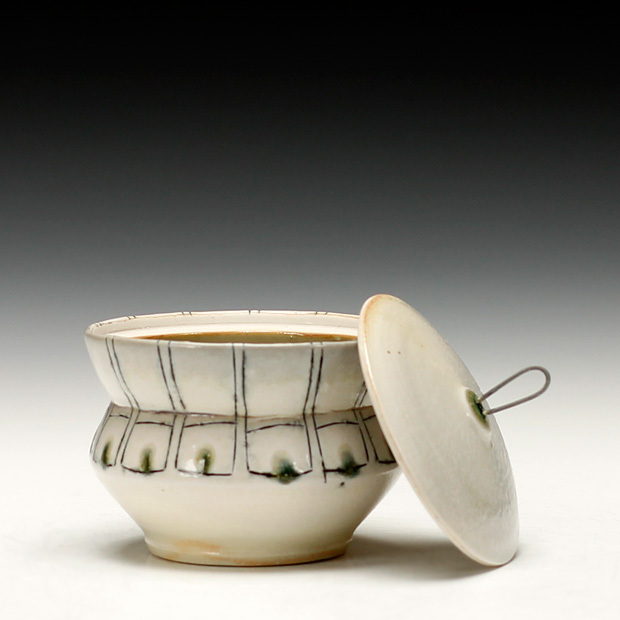 I work with porcelain because of its unique characteristics as a material. All of my work starts out on the potter’s wheel. It is then cut, stretched, added to, and subtracted from, off of the wheel. In recent years I’ve become immersed in drawing on the surface of my work. Initially, the repetitive patterns that I used came from textiles and medieval costume. Recently, I have enjoyed drawing in a more intuitive way, allowing the mark making to respond to, and echo the form. I use an exacto knife to draw on my leather hard pots. Then, I fill the lines with black slip, allow it become leather hard, and scrape the excess off with a metal rib. The final step is to clean up the surface with a sponge. This technique of slip inlay reveals a very fine black line. After the pots are bisque fired, I go back and add color with glazes and slips, using wax and latex. I fire in a wood/soda kiln to cone 10/11. After 24 years of working in clay, I’m still fascinated with the alchemy of ceramics. I like to continually discover what these materials can do. I find the process of soda firing challenging and exciting. I want to keep the element fire alive in my work. My surfaces rely heavily on repetitive pattern. 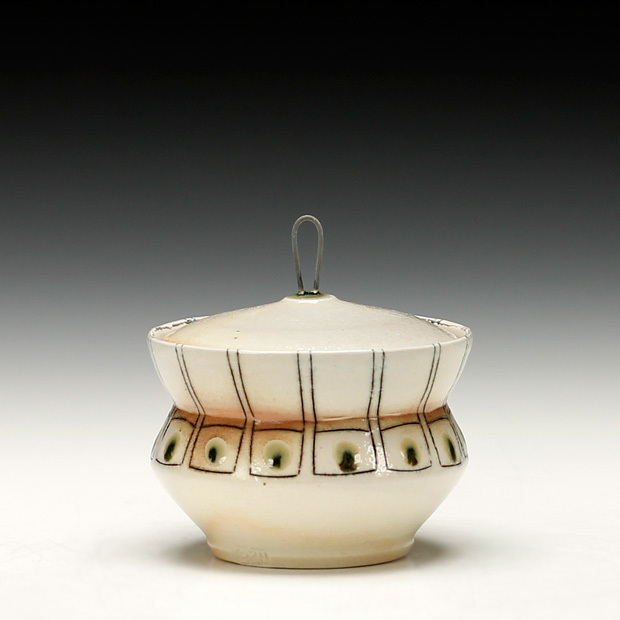 The directional nature of soda firing turns a predictable pot into a piece that changes from one side to the next, requesting further interest and investigation. 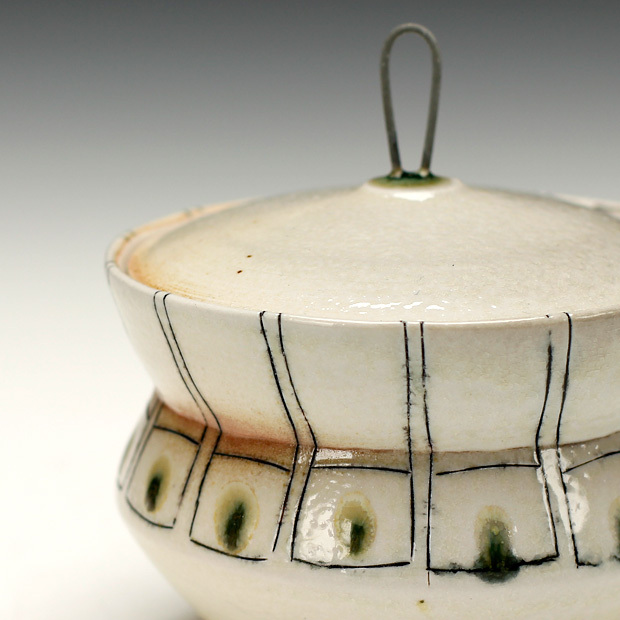 Firing my work combines the method of soda firing that I originally learned from Brad Schwieger at Ohio University in Graduate school, and the kiln design of Doug Casebeer that I learned to appreciate while a resident at Anderson Ranch Arts Center. My recently built (Jan. 2011) kiln is based on a kiln that Doug Casebeer built at Anderson Ranch, known as the “Little Vic”. It is a 45 cubic foot, bourry box style wood kiln with forced air/natural gas burners, in addition to an oil burner that I sometimes use with vegetable oil. I fire to cone 10/11, in a heavily reducing atmosphere. I candle the kiln overnight, and fire with the burners until I’m through body reduction. Then I start stoking with wood. I fire with gas, wood and sometimes oil until cone 10 is down. I close the damper two inches, and continuously stoke wood while spraying 3 pounds of soda ash mixed with two and a half gallons of water into the kiln all at once. Stoking with the kiln dampered down produces unused fuel in the atmosphere, trapping carbon on the surface of the pots. The finishing step is creating an oxidizing atmosphere to brighten the color of the glazes. I open the damper and turn the air up on the burners for fifteen minutes. I let the kiln cool for 36 hours before unloading.